Sandwiches: 1/2 cup Cream Cheese, Low-Fat Whipped, or Goat Cheese 4 pieces Focaccia or other good quality bread, sliced in half, lengthwise 2/3 cup Spinach, washed and dried 4 slices Tomato Preparation Eggplant: Preheat grill to medium heat. Add olive oil, garlic, salt, and fresh ground pepper and Â½ teaspoon fresh chopped basil to small bowl. Stir to combine. Brush both sides of eggplant slices with olive oil mixture. Grill eggplant over direct heat, 3 minutes per side. Sandwiches: Mix cream cheese, 1-tablespoon fresh chopped basil, salt, and fresh ground pepper in small bowl. Spread 4 halves of focaccia bread with cheese mixture. Top with spinach, slice of tomato and focaccia bread slice. Cook the beans until crisp-tender. 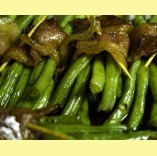 Wrap about 10 to 15 beans in each bacon strip; secure with a toothpick. Place on a foil-covered baking sheet. Drizzle honey and Olive Oil over bundles. Bake at 400 degrees F for 10-15 minutes or until bacon is done. Remove bundles to a serving bowl or platter; serve immediately.